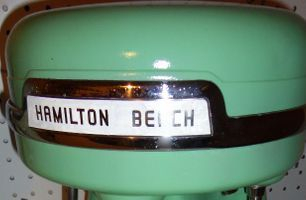 Hamilton Beach Malt Mixer Photos! The triple head mixer is considered by many to be the "Cadillac" of all malt mixers. Made for 40 years, there were only minor changes when the 940 replaced the 40DM, which was manufactured during the last few years of production. Most parts are interchangeable between the two mixers, except for the cup holders. Cup holders for the model 940 are removable and attached with thumb screws. The triple heads were made in jadeite green, almond and hard-to-find black. Check the plate on the back of the mixer to find the model number. Colors, Plus a Custom Red. We resurfaced these mixers with new porcelain. At a customer's request, we finished one in red to match his kitchen. Models 30, 930, 33, and 933 are all single head machines. They are a good alternative for those who do not want the large triple head malt mixers or milkshake machines. Many of the parts are interchangeable among all four machines. These models were manufactured in jadeite green, almond, and black. The model number of your mixer can normally be found on the band around the mixer head. Occasionally the number is under the base. Model 30 is larger and considered heavy duty. Model 33 has a smaller head and is a medium duty machine. Models 10, 12, 18, 22, 25, 27, and Older. These machines are older single head malt mixers. They were introduced in the late 1920's. Except for the Model 27, the motor bearing is located on the top of the mixer head, giving them the appearance of wearing a top hat. Originally, a malted milk was only malt powder mixed with chocolate and milk, therefore the motors of the machines were not very powerful. When some inventive soda jerk plopped a scoop of ice cream in a malted milk, it started the malt craze, and machines from then on required larger, heavy duty motors to blend the ice cream. Models 18, 25, and 27 have the model number stamped on the label. Made in jadeite green, almond, and black, the 25 and 27 are medium duty machines. The Model 25 label is similar to the label on the 27. The difference is in the shape of the head. The Model 27, introduced just before models 30 and 33, was the first machine to have a dome top. The Model 18 was the first and only heavy duty dual-purpose malt mixer introduced. The 18 mixing blade will whip ice cream as well as function as a bar mixer and stir ice. Unlike modern day blenders, malt machines were not designed to break large ice cubes. Use crushed ice from your ice maker, and the 18 will easily stir it. Find the model number on the front label. It is considered a heavy duty machine. They were made in jadeite green, almond, and black. 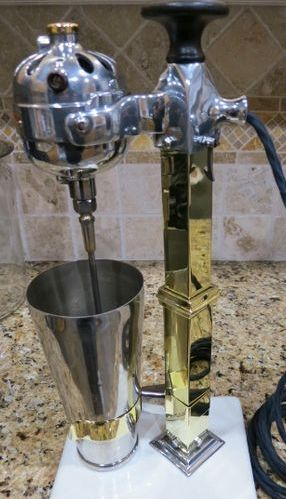 Model 18-B Barmixer was made specifically for bar use. Some 18-B's are also labeled Bacardi Mixers, as there is a recipe for a mixed Bacardi drink printed on the front label. The model number is on the label. over the switch, pulled down and held during the entire time the machine is mixing. Most motor parts fitting other Hamilton Beach mixers are not interchangeable with the White Flash. On a marble stand, this malt mixer is marked "patent pending." Some of the earliest models were nickel over brass. The above malt mixer has had the nickel removed, which is easily done, and the brass shined to a beautiful luster by one of our favorite customers. This hard-to-find machine was the first of the heavier duty machines. restored by one of our parts customers. Well worth the effort! The small Model 51 mixer is probably the most under rated mixer that Hamilton Beach made. The body was made of cast aluminum and came in white, chrome, and brushed stainless. The accompanying square cup was made of either white plastic or the more rare clear plastic. Both had the Hamilton Beach name printed in red across the front. Because they were plastic, most of the cups have been broken and are missing. Made from 1951-1963, the mixer is a single speed. The year of manufacture can be determined by looking on the bottom, where it has been stamped. This is the only mixer that Hamilton Beach consistently dated. It has the same good four-fold "butterfly" mixing blade in a smaller size, which makes it an excellent small mixer for malts and milkshakes. From a distance, the 51 is often confused with the new plastic models. The new models are made of light-weight plastic, and the blades, which are flat wavy metal or plastic discs, are static and do not move. To make sure you're getting an original Model 51, always check the mixing blade to make sure that it has the "butterfly" blade with movable or "floppy" edges.